Hello friends who have not given up on me since my lack of posts for over a month. Here for you is a tour of the garden on a rare sunny day in June. It has been raining for over six weeks here and we are all waterlogged and somewhat gloomy but in our Yankee way, resolute. The rain is pouring on the roof this morning and the felines are only opening one eye to say "what a fricking drag and jezzes christ." The garden has been growing, it is on a hill and well drained but what the sun loving tomatoes will do is anyone's guess. We do have onions, garlic greens, lettuce, peas, chard with beautiful stalks of pink and yellow and the last of the strawberries to gather before they rot. We did mulch them with straw but this summer, they should have had more. Any lying on the ground are grey and gone. The strawberry farm down the road is probably a disaster this year and the corn fields by the river are sodden with stalks only a few inches high. But here is a tour on a lovely, hopeful day in June. Everything has grown a lot since these photos. 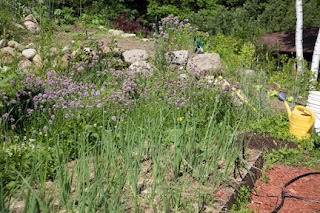 The raised onion bed. Good thing it's raised and drains well. 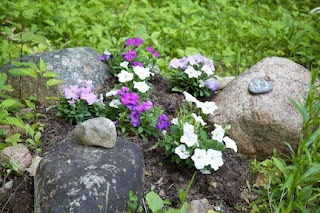 The purple flowers are Olof's beloved patch of chives. 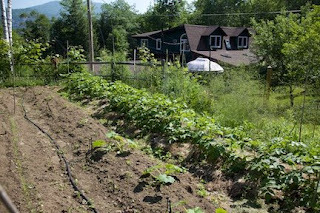 The potato field with the squash just beginning. 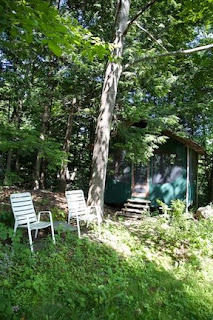 The elder's home below with their summer gazebo on the deck. The felines hide in the tall grasses behind the potatoes and keep watch. They also have catnip bushes to lie in and dream away the summer days. When it is not raining. 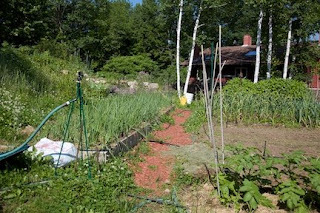 The path by the onions, well mulched this year. A good thing or the weeds would be knee high. They like lots of rain. Another view, our house below. 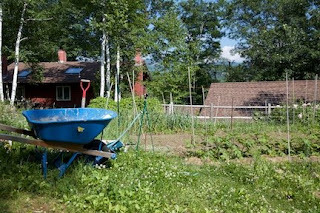 The upper terrace above the terraces for strawberries, raspberries and blueberries. 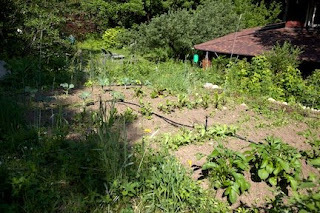 Potatoes can be seen and small broccoli, radishes and chard. 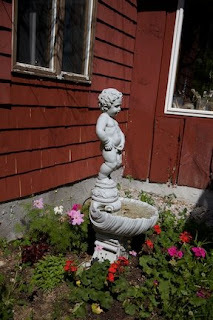 Olof lived in Brussels once and never forgot The Little Pisser. The Tea House. Below it is a lovely ravine where the brook is rushing waterfalls this year. Olof built this one summer when I was away for a week. I should go away more often, eh? Our beloved Brendan lies here by the upper pond with his brother Finnegan (known as Innigan Outigan Finnegan) and Silas the Faithful. Fergus is in an urn on the shelf, waiting for when we shall meet again at the Rainbow Bridge. My favorite room in my home. We have dinner with friends here on summer evenings. When it is not pouring rain. Hello to all, how's your summer? How nice to have you back. Love the pictures. It's fun to see how net friends live. I envy you all the kitties. All I have now is Helouise, who is getting old and, as always, aimiable and cautious but not very interesting. Her brother, Abelard, I loved, but he vanished about 3 years ago when I was in England. I have a memorial to him in my garden. Summer has been lovely until the last 3 days. We are supposed to have sun again tomorrow. What a wonderful place you live in. Your tea house is delightful and I am super jealous of your garden. The cats must have fabulous fun romping around the garden, and we are glad to hear the rain has stopped for a while. We missed you, welcome back. what a wonderful garden! beautiful!!! Lovely blog. I've just found it. Thank you for sharing your lovely garden and house with us. What great places for kitties to explore! What a lovely tour! Thanks for sharing! oh, this is beautiful. 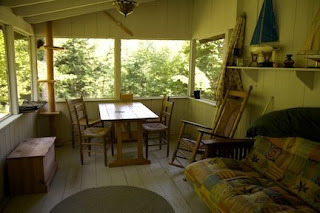 I especially love the porch. I dream of the day when I can screen mine in and use it as a room. I am also jealous of your garden. After a spring of spinach and lettuce, I'm afraid the weeds have claimed mine. Thanks for posting these!